What happened next seemed somewhat miraculous. 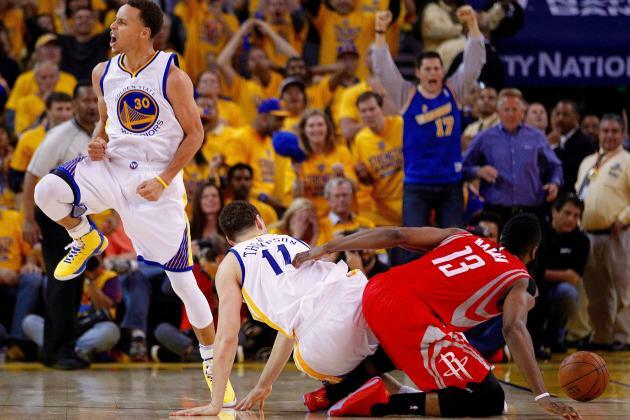 Harden found himself surrounded by the Splash Brothers, the ball got poked away, and it rolled around on the floor for what felt like an hour. I was sure that at any moment a foul would be called, or Harden would suddenly pick up the rock and launch a ludicrous shot that would swish. But that is Old Warriors thinking. Doomed defeatist thinking. In the glorious world of Warriors Present, the ball just trickled around down there until the clock expired. The W’s took a 2-0 series lead, James Harden tore down some curtains on the way to the locker room, and I went to rest my face against the cool glass of the living room window and let my heart get back to normal. I will tell you honestly that I don’t know how the Rockets are doing it. Earlier this year Harden said of the Warriors, “They ain’t that good.” And quite frankly the Rockets ain’t that good — at least in my rational evaluation — but somehow they keep playing as if they were. They just keep coming and coming. You have to give them credit, and you even have to say something nice about Big Softie Dwight Howard, who played through a knee injury to post 19 points and 17 boards. On the Warriors side, Andrew Bogut had a huge game, scoring 14 much-needed points, blocking 5 shots, and discouraging many more. Steph was Steph, putting up 33 and leaving Jeff Van Gundy struggling to come up with new superlatives. Our boy Klay Thompson has been quiet in this series, but he’s been spending most of his time chasing Harden around, a thankless task if ever there was one. Harden has still scored 66 points; you shudder to think what he might have done if not constantly harassed. Before this series started, I was telling anyone who would listen that the Warriors would sweep. It’s hard to feel too good about that prediction right now. Both games have been close, and now we head to Houston for Games 3 and 4. It is possible, I suppose, that the Dubs will find the extra gear they haven’t had so far in this series, and crush the dreams of the good people of Houston. That would be nice. It’s also possible that this will be a knock-down, drag-out, classic playoff series, and that would be OK too. It may take some years off my life, but so what; these are the good old days right now, aren’t they? This entry was posted	on Friday, May 22nd, 2015 at 9:55 am	and is filed under Golden (State) Years. You can follow any responses to this entry through the RSS 2.0 feed. You can leave a response, or trackback from your own site.